What do you do when you have leftover bananas that are getting too ripe? You make banana bread! 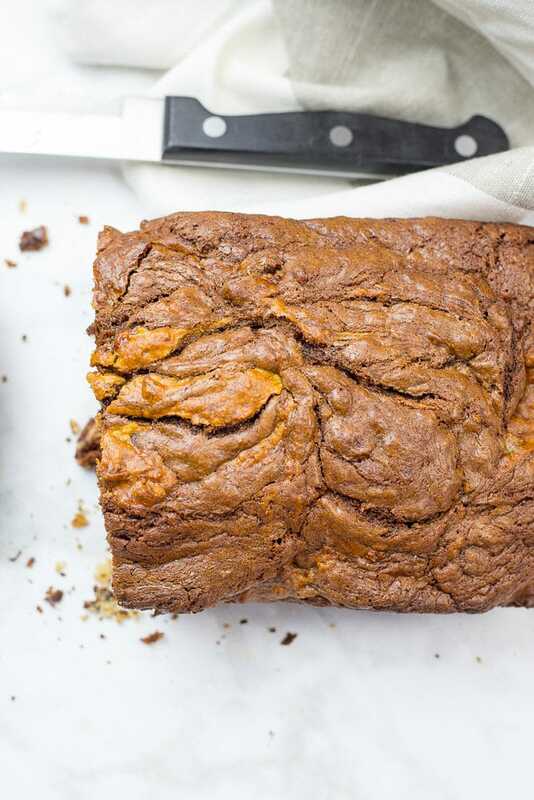 But what if want to make banana bread, except you want to change it up a little and make it more dessert-y? 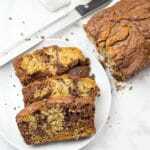 You make banana bread with Nutella swirls, of course. Please tell me I’m not the only one who does this: I buy fresh produce, and then life happens and I don’t get around to eating it until after it’s gone bad. Womp, womp. But, hey, that’s the beauty of buying bananas. I know there’s a point at which they truly do go bad, but they have this magical quality where they achieve a stage in between fresh and rotten. You see, once they’re just past being too ripe for eating, bananas are perfect for baking. One of my favorite things to do with over ripe bananas is making banana bread–a classic. But today I thought I’d try a little twist on the boring old standard banana bread. I made banana bread with Nutella swirled into it. And, yeah, it was good. I’ll do this again for sure. For the base of this recipe, I used my favorite banana bread recipe. That one seriously makes the best basic banana bread I’ve ever tried, and I keep coming back to it after trying others. It’s not too dense and heavy, and it’s not too sweet. For my banana bread with Nutella in it, I opted to dial down the sugar in the banana bread base a little bit. The Nutella adds plenty of extra sweetness and you really don’t need a lot of extra sugar. First, I nuked the Nutella in the microwave to make it a bit more melty and “swirl-able.” Then I stirred the Nutella together with a little bit of banana bread batter. This helps to make sure the Nutella swirls bake up at the same consistency as the rest of your banana bread. By mixing it with a little bread batter, you’ll help to ensure that the bread holds together when you slice it and that the texture will come out just right. 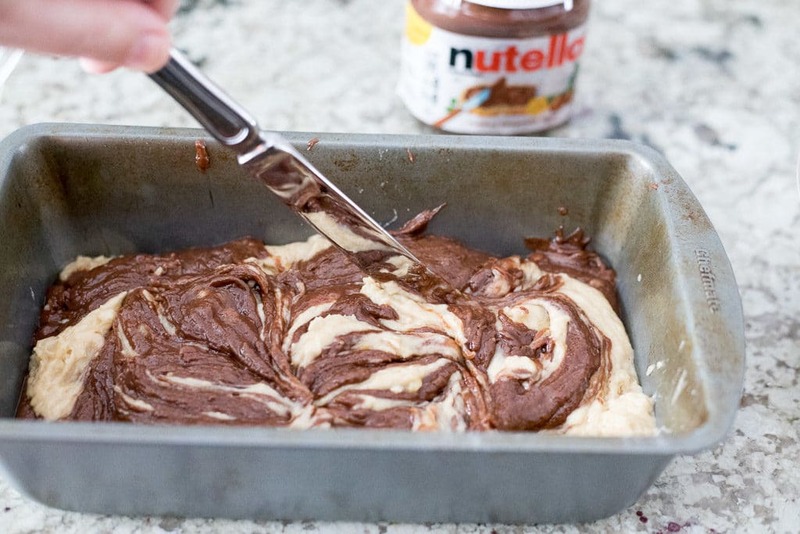 When you’re pouring your batter into the baking pan, add spoonfuls of the Nutella mixture throughout. After you’ve used up all the batter from both bowls, take a knife and gently drag it through the batter in the pan to make some swirls. Then throw it in the oven, and enjoy your delicious banana Nutella treat. Need other ideas for what to do with ripe bananas? Try these three-ingredient banana cinnamon pancakes. 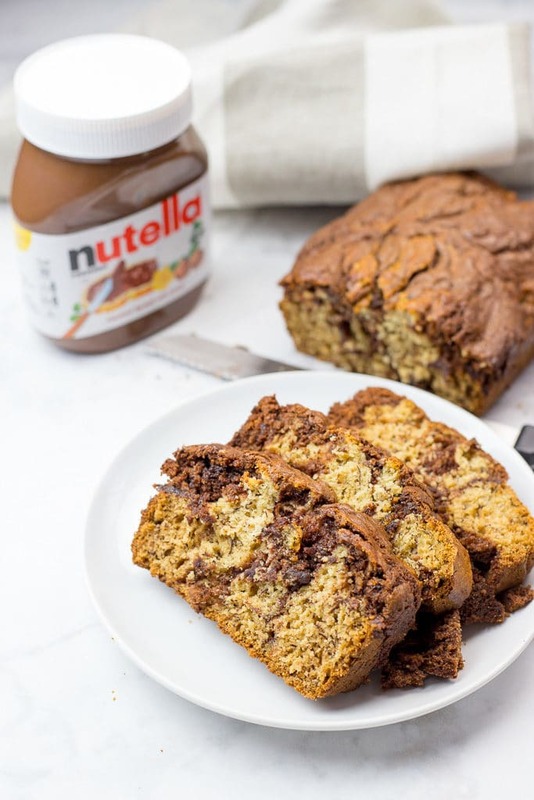 Who needs plain old banana bread when you can have banana bread with Nutella in it? Preheat the oven to 350°F. Coat the inside of a 4x8-inch loaf pan with cooking spray. In a large mixing bowl, mash the bananas with a fork until smooth. Then stir the melted butter into the mashed bananas. Mix in the baking soda, salt, sugar, egg, and vanilla. In a microwave safe bowl, microwave the Nutella on high power for 30 seconds. Give it a good stir. Then add about 1/2 cup of the banana bread batter into the softened Nutella and stir to combine. 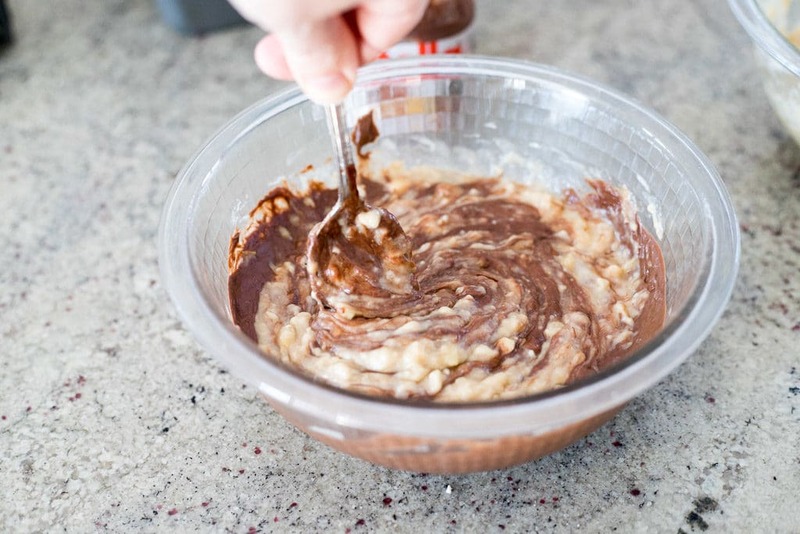 Add the banana bread batter into your loaf pan, alternating spoonfuls of the Nutella mixture spread throughout. Drag a knife through the pan a few times to create swirls. Then bake for 50-55 minutes at 350°F. After letting the banana bread cool for a few minutes in the pan, remove the banana bread from the pan and let cool completely on a wire rack before slicing and serving.